‘Big bags’, as the name suggests are rather heavy duty packages used for bulk-packing items like building materials, flour, rice and pet food among several others. Uflex Limited apart from possessing superior capabilities of providing end-to-end flexible packaging solutions for semi-solids, viscous fluids, pastes and gels is an undisputed Industry Leader offering packaging solutions for solids, granular materials and powders as well. Right from as little as 5g to as much as 40kg, Uflex can pack it all with finesse. A daunting challenge confronting the big bag industry was the difficulty in manufacturing High Coefficient Of Friction (COF) anti-skid bags in matt option owing to the inherent properties of the ordinary OPP film. A high COF is imperative for stacking big bags on to the pallets. Bags made from ordinary matt finish oriented polypropylene (OPP) film cannot be stacked as they skid during palletisation. Thus there has been a burgeoning demand from the global clientele for big bags in Matt finish option. Immaculately engineered Big Bags by the Converting/ Packaging Business vertical of Uflex are made by combining high COF, Low SIT, High Seal Strength Matt Bi-axially Oriented Polypropylene Film and High-Performance Woven Polypropylene (WPP) fabric. This combination imparts high strength to the bags making them fit for heavy duty applications. The big bags made of this special film have qualified the critical drop tests as laid down by the ASTM standards. This Low SIT High Seal Strength Matt Bi-axially Orientated Polypropylene Film engineered by the Packaging Film Business vertical of Uflex offers a number of positives like high haze >75%; Low Seal Initiation Temperature (SIT) – 108°C; low gloss on matt side; excellent matt dispersion; good contact transparency and excellent homogeneity. The film also exhibits high Hot-Tack strength and imparts paper like matt look to the bag significantly enhancing its aesthetics. This special film used for manufacturing big bags allows good stacking and sealing for pinch bottom. Pinch bottom is the process of step-cut sealing at the bottom of the bags through hot air purging. The pinch bottom option offers far superior sealing as compared to conventional methods like bottom fold taping and stitching. Above all, pinch bottom offers a leak-proof seal as opposed to ordinary sealing. 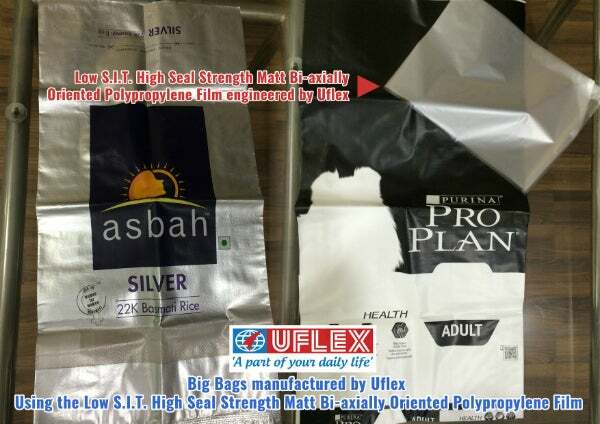 Commenting upon the success of this specially engineered packaging film, Mr Ashok Chaturvedi, chairman and managing director Uflex Limited, said: "Low SIT High Seal Strength Matt Bi-axially Oriented Polypropylene Film has appropriately addressed the inherent lacunae of the ordinary matt finish OPP films and is pegged as the game changer for big bags owing to the host of benefits that it brings along. This film therefore is a classic example of innovation by Uflex to create value added differentiation for clients globally. "I am happy for the contemporary solution oriented approach of my R&D teams across business verticals and congratulate them on this success. The USP of Uflex lies in the very fact that we are a fully integrated end to end global flexible packaging solution company. This innovation is yet another testimony of the synergetic interplay of our business verticals coming up with a profoundly innovative packaging solution."